You ever spy a bunch of beautiful squash and end up buying them even though you have no idea what you’re going to make with them? No? Just me? Once I got them home, I thought the savory flavors of the kuri paired with the sweeter delicata and acorn would make a tasty soup. My instincts were right on. This is honestly in my top five recipe creations of all time. It was so good, rich and creamy and full of flavor. It will definitely be a regular player on the dinner table this winter. I paired it with a Paris Valley Road Chardonnay. While not usually a big Chardonnay fan, this wine was absolutely transformed by the soup, complimenting the sweetness and supporting the creaminess beautifully. Preheat oven to 350 degrees F. Cut squash in half and remove strings and seeds. (I kept some seeds for next year’s garden.) Place cut-side down onto a cookie sheet lined with parchment paper and cook until a fork can slide into it, about 20 minutes. On the stove top, heat a saute pan over medium-low. Add the butter and sage and swirl around the pan until butter begins to turn a light brown. Remove from heat and pour into a bowl. Return pan to stove, turn heat up a bit, and cook onion, garlic, salt, pepper, and garam masala until onions begin to turn translucent. Turn off heat. In a blender or food processor, mix squash, butter and sage, onion mixture, and stock a little at a time (Probably around two cups each try) until everything is blended smooth. Pour blended mixture into a large pot and continue until everything has gone through the cycle. Place pot back on the stove and reheat on low until soup begins to slowly bubble. Stir in a squeeze or so of sriracha for a bit of heat, and taste to see if any other spices need to be adjusted. Spoon into bowls and serve with some crusty sourdough bread. 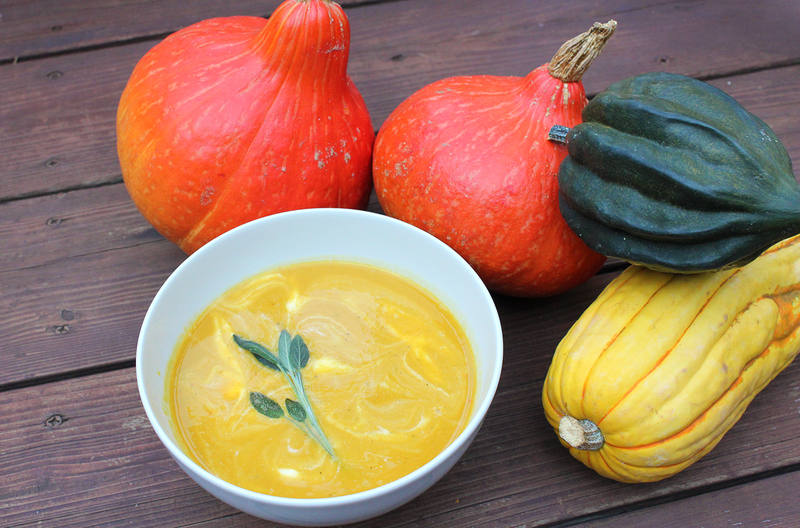 I love the picture of the squash and the soup.